While this may not rise to the level of reinventing the target shotgun shell, it is reinventing the Federal target shotshell. The reload-ability of shotgun shells has been largely set aside over the years. Years ago, it was straightforward: the 12 gauge hulls that were considered ideal for reloading were the old Winchester AA's or Remington STS / Nitro 27 loads. Everything else was second-rate. With the redesign of the AA hull into the so-called “HS” hull to save on production cost, it became strictly STS territory for a premium reloadable hull. Back in 1998, Tom Armbrust was able to show that there was no noticeable degradation in ballistic performance with STS hulls reloaded 12 times. The new Gold Medal Grand hulls brag of 16-17 reloads per hull, Federal appears to have exceeded that level. I personally trash hulls after 7 reloads and that isn't going to change: if the crimp doesn't look like factory, I have no use for them. Few shotgun enthusiasts bother to pattern their loads and far fewer check velocities and standard deviations. Federal also claims better, more reliable ignition. That well may be true, however I've not had any ignition problems with economical Federal Top Gun shells, for example, so I'll just take their word for it. Federal also claims lower recoil. Roughly 5% less. Humans cannot detect a small decrease in recoil, of course, on of the reasons that so many gun manufacturers tout a 50, 60, or 70% decrease in recoil. No one can really dispute “felt recoil,” it is matter of personal opinion. We know we don't like it, of course, but there is no universal agreement on the most effective recoil pad for example, where reduction in recoil is the whole point. The fairly reasonable approximate recoil reduction of 5% got changed, though, as soon as marketing got a hold of it and that's a shame. Now, it has mystically and inexplicably jumped to 17% less kick. For the reloader to net the recoil reduction, it will require that they use the new Federal wad: those are not available yet, much less the data, so hopefully Federal (and Alliant) will be forthcoming on these two counts: they will sell a lot of wads if they follow through on this. 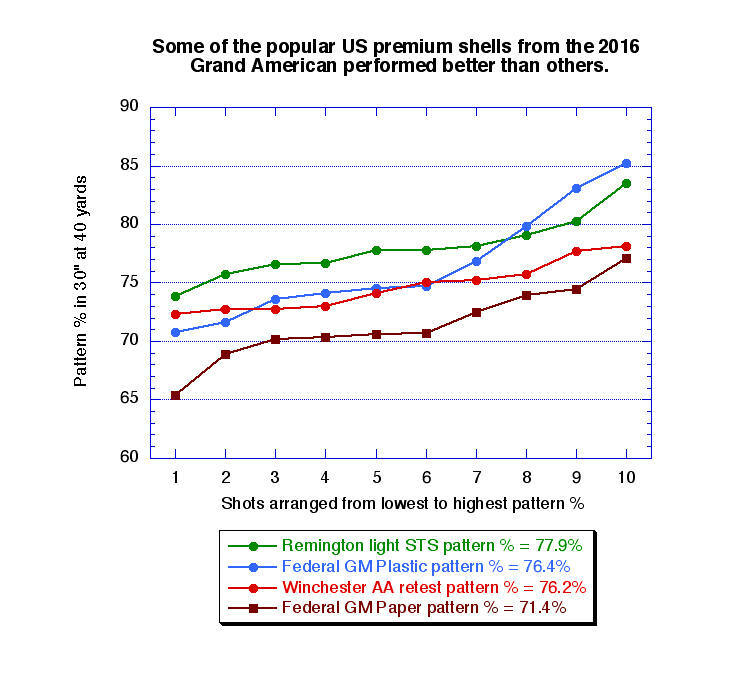 Federal testing's recorded increase in pattern efficiency is far more interesting: 77.09% 40 yard pattern efficiencies compared to the 72.96% pattern efficiencies from the classic Federal Gold Medals. 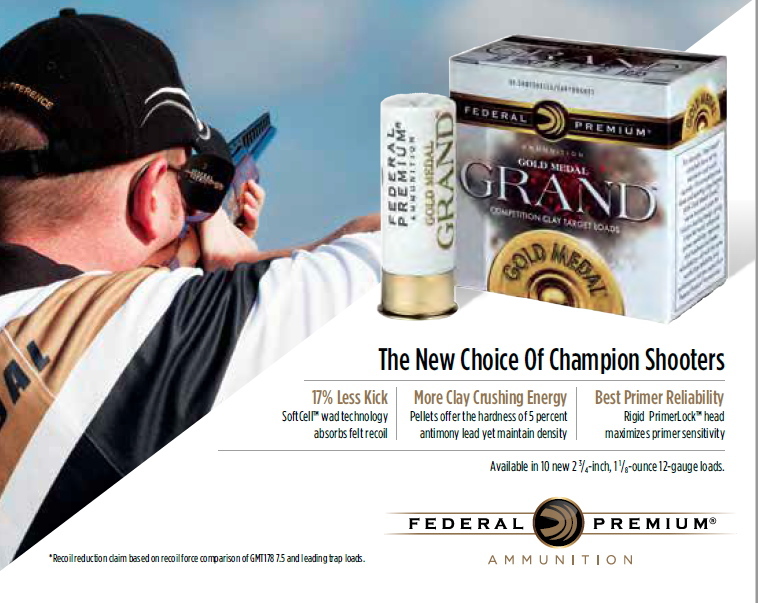 Neil Winston's annual testing recorded the 'old' Federal Gold Medals at a very good 76.4% percent pattern efficiency, so the approximate 4% increase from Gold Medal Grand shells would make it the best target load on the market, quite capable of breaching the elusive 80% barrier of 40 yard pattern efficiency under many sets of ambient conditions. The shot is hard, spherical, and consistent in diameter. I'm not quite ready to pronounce Federal Grand 12 gauge shotshells as the best performing target shotshells on the market, but they are indeed a competive shell, averaging right at 75% pattern effciency out of my B-80 with a Trulock .035 inch constriction Precision Hunter choke (actual constriction in my gun .034 inch). I've not had any ignition problems, but I've not had ignition problems with any name-brand shells. The claimed recoil reduction of about 5% may well be true, but it isn't something that obviously can be felt. The "new" ad-brag of "17% less kick" is not legitimate in my view. The extended reloading life is welcome, but at the same time as the new wads are not available to reloaders whatever you might feel is a slight recoil reduction isn't possible with your reloads.